The What: Extron Electronics will begin shipping its DSC HD-HD, a compact high performance, HDCP-compliant scaler that converts between HDMI resolutions and frame rates. The What Else: The Compact HDMI to HDMI Scaler accepts video from 480i up to 1920x1200, 1080p, and 2K, and offers high performance upscaling and downscaling with multiple output rates up to 1920x1200, including HDTV 1080p/60 and 2K. 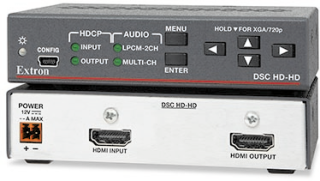 The DSC HD-HD features advanced Extron video signal processing with 1080i deinterlacing and Deep Color processing for optimal image quality. It includes many integrator-friendly features such as on-screen display, test patterns, and EDID Minder. The DSC HD-HD is ideal for applications that require scaling HDMI video to match the different capabilities and requirements of sources, displays, videoconferencing codecs, and other equipment. The compact form factor allows simple integration at a source, destination, or in a distribution system. The DSC HD-HD offers several features that enhance and simplify AV system integration. EDID Minder automatically manages EDID communication between the source and display to ensure reliable operation. Easily accessible on-screen menus provide control over the unit’s functions and settings, including quick access to key parameters such as input and output video formats and resolutions. Remote configuration and control are also available via USB. The Bottom Line: "AV integrators often need a simple solution for matching different HDMI video resolutions in professional AV systems," said Casey Hall, vice president of sales and marketing for Extron. "The DSC HD-HD includes a powerful scaling engine and video processing capabilities that ensure consistent, reliable HDMI cross conversion with great picture quality." Watch the product introduction video.